Mercedes Benz Carsoft 7.4 MCU controlled Interface will provide you live data display, ECU information and repair information. Here is the step-by-step software installation guide provided. In the hard-disk driver where you pasted the whole Carsoft-MB74 software, please open the File folder of Carsoft-MB74, then open the file holder of “Step1-MB74-Installer”, double click “SETUP CARSOFT.exe” to run the MB Carsoft software installation part 1. 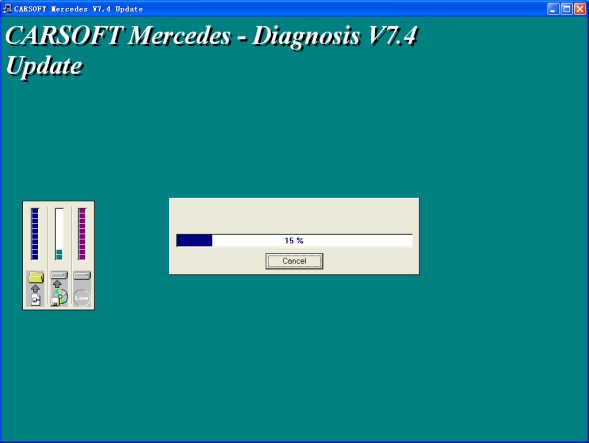 The MB Carsoft software installation asking about Software License Agreement, click “Yes” button to proceed the MB Carsoft V7.4 software installation. 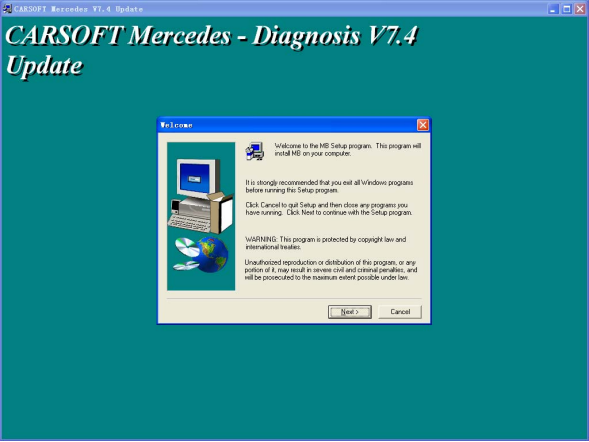 The MB Carsoft software installation asking about directory in your hard-disk, you can change the directory or keep the default directory “C:/Program Files/CARSOFT/MB” as it is, then click “Next” button to proceed the MB Carsoft V7.4 software installation. 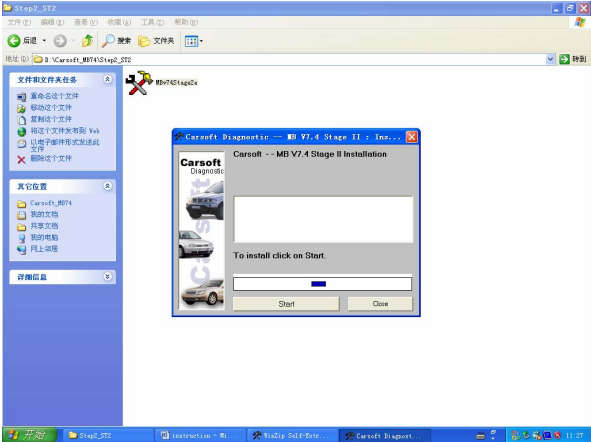 The MB Carsoft software installation asking about the name of this program, you can change the program name or keep the default name “CARSOFT” as it is, then click “Next” button to proceed the MB Carsoft software installation. The MB Carsoft V7.4 program will be installed into your computer automatically. After the MB Carsoft program be installed in your computer, you need to click “Finish” button and select the column of “Restart computer” to finish the software installation part 1, then restart your computer for system recognizing on the MB Carsoft device. 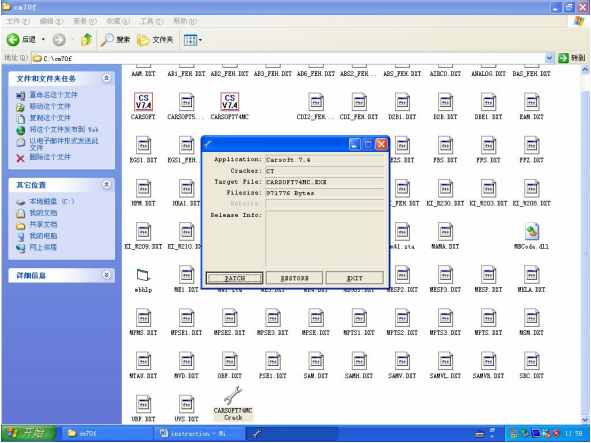 In the hard-disk driver where you pasted the whole Carsoft-MB74 software, please open the File folder of Carsoft-MB74, then open the file folder of “Step2-ST2”, double click “MBv74Stage2e.exe” to continue the MB Carsoft software installation part 2. 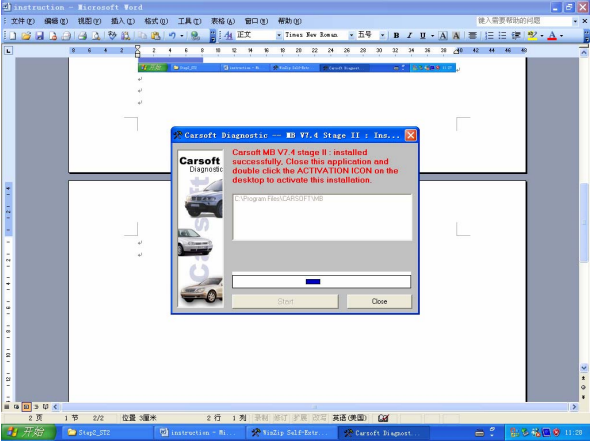 After you click “MBv74Stage2e.exe” to continue the MB Carsoft software part 2, the Carsoft-MV V7.4 Stage II Installation surface will be shown up, then click “Start” button to proceed software installation part 2. Then the software installation surface will show up “Crasoft MB V7.4 Stage II Installed successfully…”, click “Close” button to finish the software installation part 2. In the hard-disk driver where you pasted the whole Carsoft-MB74 software, please open the File folder of Carsoft-MB74, then open the file holder of “Step3-ST2SP1”. In the file holder of “Step3-ST2SP1”, you may find “MBV742SP01E.exe”, double click “MBV742SP01E.exe” to continue the MB Carsoft software installation part 3. After you click “MBV742SP01E.exe” to continue the MB Carsoft software installation part 3, the Carsoft-MB V74 SP01 installation surface will be shown up, then click “Start” button to proceed software installation part 3. Then the software installation surface will show up “Searching Carsoft files…”, then there is a dialog window shows up “Necessary files not found, (please install MB V7.4 State II first)”, just click “Confirm” button to finish the software installation part 3. 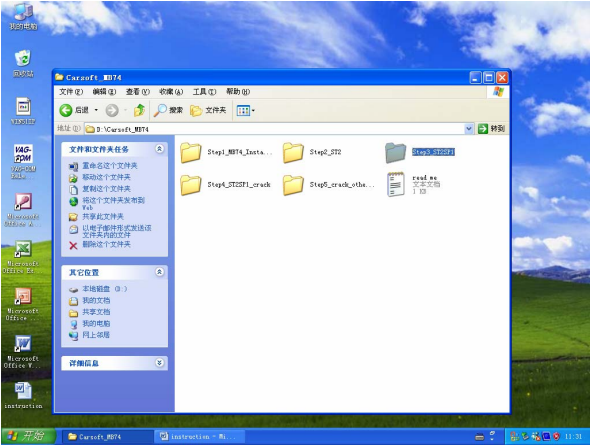 In the hard-disk driver where you pasted the whole Carsoft-MB74 software, please open the File folder of Carsoft-MB74, then open the file holder of “Step4-ST2SP1-crack”, copy all 6 files in this holder. 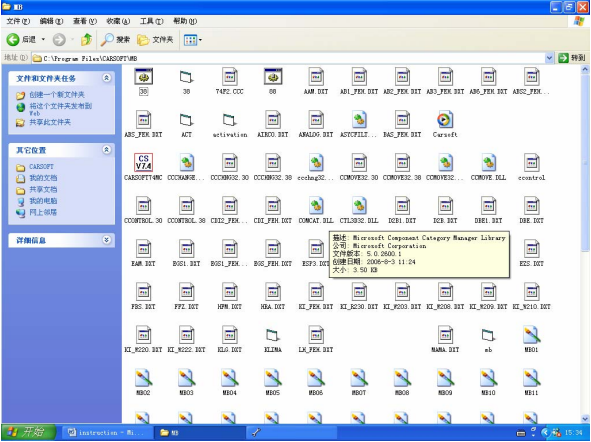 Then paste all those 6 new files into the file holder of “cm70f” at directory C:/com70f/(this directory was created during the MB Carsoft software installation automatically). 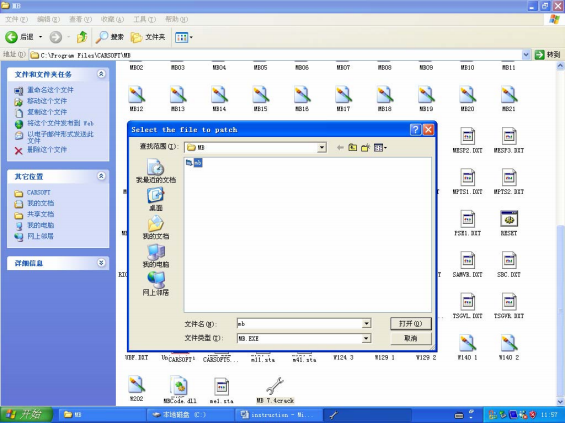 The system will ask you if you want to replace old file during pasting those 6 new files into the file holder “cm70f”, click “Yes” button to replace all old files by cracked 6 new files in “cm70f” file holder. 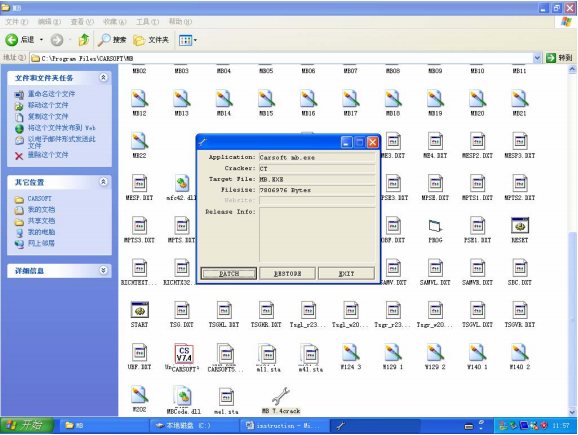 Also, copy all 6 files from the file holder of “Step4-ST2SP1-crack” holder, and paste all those 6 new files into the file holder of “MB” at directory C:/Program Files/CARSOFT/MB as well, similar to step 17-18, you need to replace all old files by those cracked 6 new files in the “MB” file holder too. 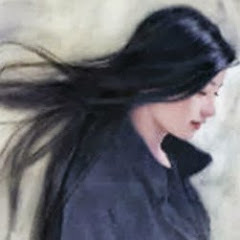 In the hard-disk driver where you pasted the whole Carsoft-MB74 software, please open the File folder of Catsoft-MB74, then open the file holder “Step5-crack-other-files”. 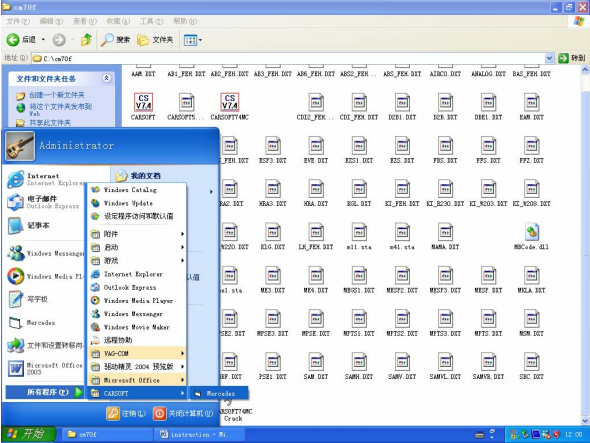 There are 2 files “CARSOFT74MC Crack.exe” and “MB 7.4 crack.exe” in this file holder. 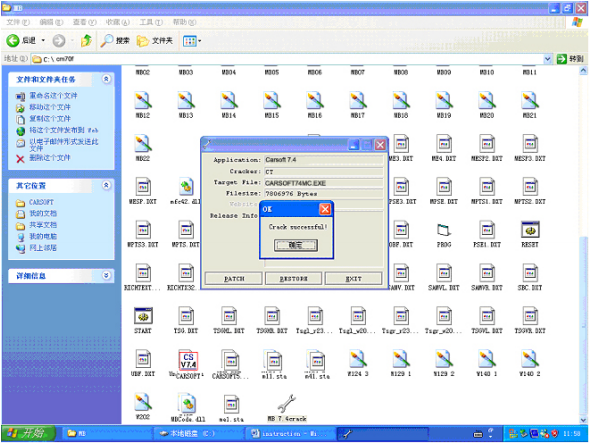 Copy “CARSOFT74MC Crack.exe” file from the file folder “Step5-crack-other-files”, then paste this “CARSOFT74MC Crack.exe” file into the file holder of “cm70f” at directory C:/cm70f/. The “CARSOFT74MC Crack.exe” program will show up a dialog window, click “PATCH” button to proceed. After you clicked the “PATCH” button, there is a directory selecting window shown up, select file “CARSOFT74MC.exe” from the file holder of “cm70f” at directory C:/cm70f/, click “Open” button to proceed cracking the MB Carsoft 7.4 program. After you clicked the “Open” button, the “CARSOFT74MC.exe” file will be cracked, and a “Crack successful” dialog window will be shown up, then click “Confirm” button. 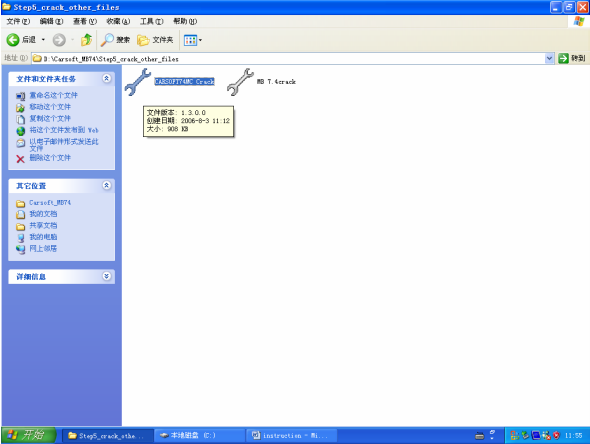 In the hard-disk driver where you pasted the whole Carsoft-MB74 software, please open the File folder of Carsoft-MB74, then open the file holder “Step5-crack-other-files”. There are 2 files “CARSOFT74MC Crack.exe” and “MB 7.4crack.exe” in this file holder. 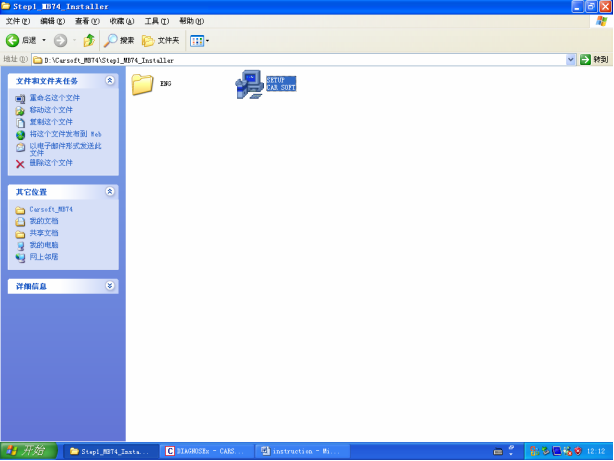 Copy “MB 7.4crack.exe” file from the file holder “Step5-crack-other-files”, then paste this “MB 7.4crack.exe” file into the file holder of “MB” at directory C:/Program Files/CARSOFT/MB. After you pasted the “MB 7.4crack.exe” file into the file holder of “MB” at directory C:/Program Files/CARSOFT/MB, then double click “MB 7.4crack.exe” to run this cracking program. Similar to step 23 to step 25, the “MB 7.4crack.exe” program will show up a dialog window, click “PATCH” button to proceed. After you clicked the “PATCH” button, there is a directory selecting window shown up, select file “mb.exe” from the file holder of “MB” at directory C:/Program Files/CARSOFT/MB, click “Open” button to proceed cracking he MB Carsoft 7.4 program. After you clicked the “Open” button, the “mb.exe” file will be cracked, and a “Crack successful” dialog window will be shown up, then click “Confirm” button to finish the whole cracking procedure. 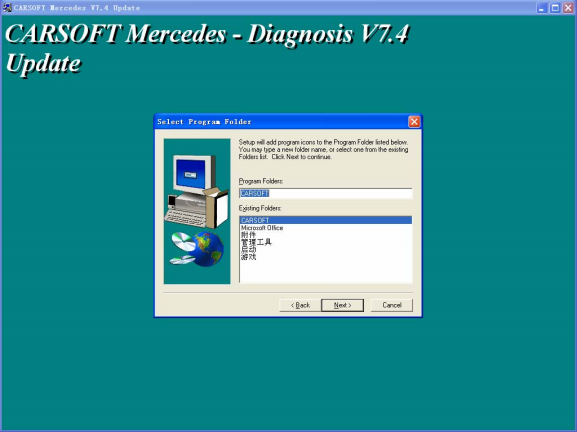 Then you can run the MB Carsoft 7.4 program now, click “Star” button at the left corner, select “Programs” menu, then select “CARSOFT” folder, click “Mercedes” to run the MB Carsoft program. Then you can see the MB Carsoft Diagnostic program surface, click “Star MB V7.4S” button to go ahead the MB Carsoft program. 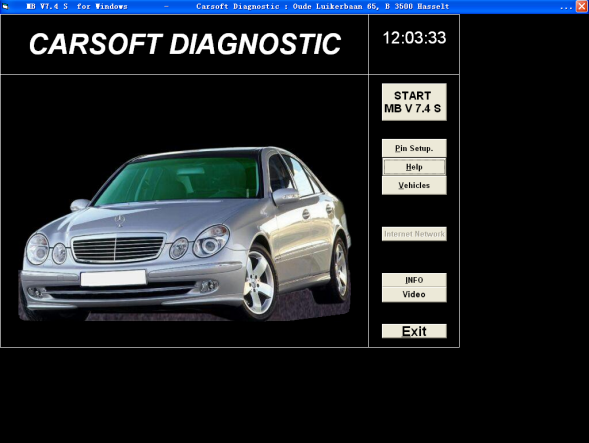 Step 32: Then you can apply full functions of MB Carsoft Diagnostic program with the hardware together.